Olivier Magny, a native Parisian, writes with an insider’s knowledge yet the unique ability to pull back and see the irony and humor of his own culture from an outsider’s perspective. His book, originally released in French and based on Magny’s blog, is a series of short observation pieces with titles like, “Crossing the Street in a Bold Way,” and “Thinking That Not Wearing White Socks Makes You a Better Person.” Magny’s spot-on observations had my husband and I laughing until tears were spilling from our eyes. I read aloud while my husband would nod and smile, then say, “oh, if this guy knows his stuff, next he’ll be talking about X.” Sure enough, the next paragraph would talk about X.
Magny helps decipher the opinionated, sometimes exasperating, but never boring Parisian psyche in a way that made him an instant best seller in France and convinced my husband that he’s a cultural genius. I admit I sometimes enjoy the discussions/debates I have with my French friends. Even when they agree, they’re likely to take the opposing viewpoint, just for fun. But there’s only so much I can take before I want to crack open the booze and play beer pong or maybe watch a Will Ferrell movie (neither of which my French friends seem to appreciate). Spot-on! I’ve seen this dance many times. I’ve even started to learn the steps. 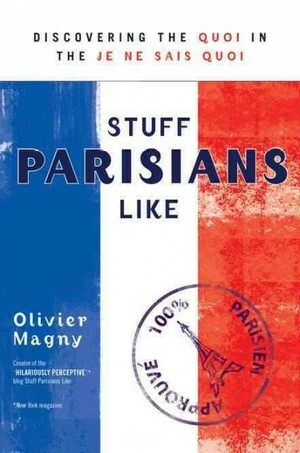 Seriously, if you love the French but are perplexed about what makes them tick, or if you hate the French and want a great laugh, and definitely if you are somewhere between these sentiments, you will love this book. This entry was posted in France, Francophile, Francophobe, French, French Language, French People, Traveling and tagged Olivier Magny, Stuff Parisians Like by A French American Life. Bookmark the permalink. Thank you for the shout out, and thank you for reading!